Precious metals advanced Thursday with gold and silver the biggest winners, rising 0.7% and 1.6%. Gold’s gain was the biggest in three weeks. Gold for August delivery rose $9 to close at $1,253.30 an ounce on the Comex division of the New York Mercantile Exchange. Gold traded from a low of $1,241.20 to a high of $1,257.90. The precious metal dipped 20 cents in the previous session. 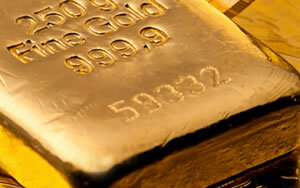 "Gold prices ended the U.S. day session with moderate gains on mostly short covering Thursday. Bullishly construed remarks from European Central Bank president Mario Draghi are credited with most of the gold market’s bounce," Jim Wyckoff, a senior analyst at Kitco Inc, said in a daily note. "The yellow metal on Thursday morning showed a surprising rally in the face of a stronger U.S. dollar index and a slumping Euro currency. Gold held its moderate gains into the afternoon as the greenback reversed and headed lower, while the Euro currency rebounded to trade near steady." Silver for July delivery added 29 cents to settle at $19.08 an ounce. Silver prices ranged from $18.67 to $19.16 and have ended higher for four straight sessions. July platinum tacked on $11.20, or 0.8%, to $1,445.10 an ounce, trading between $1,425.90 and $1,446.40. Palladium for September delivery added $2.30, or 0.3%, to $839.45 an ounce, ranging from $832.85 to $839.90. U.S. Mint bullion sales were unchanged Thursday. Silver Eagles did rise late in the day on Wednesday, up 50,000. Below is a sales breakdown of U.S. Mint bullion products with columns listing the number of bullion coins sold last week, this week and the month so far, last month, and the year-to-date.